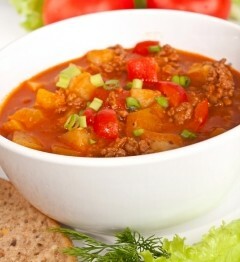 This hamburger soup recipe comes from my friends Gail and Duane. They were invited to someone’s house for lunch one day and loved this soup so much they ate several bowls each, thinking that the soup was lunch. Oops – then the hostess brought out the rest of the meal and they had to brave their way through it. I think of them with a smile each time I make this recipe, and that’s quite often. Brown meat and drain off fat. Add onion and sauté about 3 minutes. Combine all ingredients in large 5 quart pot or crockpot and simmer for a minimum 2 hours. If you are using a crock pot you can cook it all day. Makes 18 ladles & freezes well. I have added a small can of kernel corn to give it some color. Try anything else that strikes your fancy. This hamburger soup recipe is pretty healthy. One of the changes you can make to make it even healthier is to use low sodium beef broth. The regular is pretty salty, and although it tastes good, packs a lot of salt into the soup. I would replace at least one of the cans/boxes of stock with the low sodium version, or your own homemade beef stock, which will be lower in sodium too. This soup recipe makes about 10 servings, although it’s so good you can’t count on it really serving 10 people. They’ll be like my friends, back for more and more. 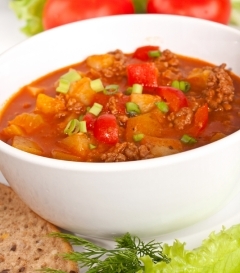 If you love this hamburger soup, look here for more great soup recipes. It calls for 3 cans of consomme..what does that equal too seeing as how it doesnt give the size or amount in each can. From Karen: Use regular soup can size, which I think is about 10 ounces. This soup is delicious. If your diners don’t care for barley, you can substitute some diced potatoes. And ground turkey makes a tasty alternative to ground beef, if you’re serving people who don’t care to eat red meat. Hearty and savoury! I added a few of our faves like 3 potatoes cubed, 1 pkg of knorr red soup, and doubled the barley. This soup didn’t make it to morning. Everyone, even my pickiest eater loved it. This is my fave recipe. I am such a soup person and this one warms the soul….especially on cold winter days! I like to change it up from time to time, one time I make it with ground turkey, one time I make it with mushrooms and cut green beans. It’s a great recipe to just add to and play around with. Adding different veggies is a great way to make it different every time!